This week I’m in Bangkok, shooting a job for the Asia Foundation. The Asia Foundation is a non-profit, non-governmental organization committed to the development of a peaceful, prosperous, just, and open Asia-Pacific region. The Foundation supports Asian initiatives to improve governance, law, and civil society; women’s empowerment; economic reform and development; sustainable development and the environment; and international relations. Drawing on nearly 60 years of experience in Asia, the Foundation collaborates with private and public partners to support leadership and institutional development, exchanges, and policy research. The first part of my assignemnt was to shoot images of The TRY ARM brand. Try Arm is a small company making underwear. Although not associated with or funded by The Asia Foundation, Try Arm could be used as an example of one of the inequities that The Asia Foundation is working to correct. Try Arm originated in the protest camp occupied by Triumph International Thailand Labor Union workers engaged in a months-long struggle against their unlawful dismissal by their employer. After more than 20 years of laboring under exploitative garment factory conditions while serving as a beacon for social movements throughout Thailand, TITLU workers have responded to their employer’s final act of union busting by applying their longstanding commitment to democracy and economic justice to the production process itself. Combining extensive manufacturing experience with an unwavering social conscience, Triumph’s former union employees have now begun to produce TRY ARM undergarments and swimwear according to principles of sweat-free labor and workers’ self-management. We hope that you enjoy these high quality products in which each TRY ARM cooperative member has an equal, vital stake. 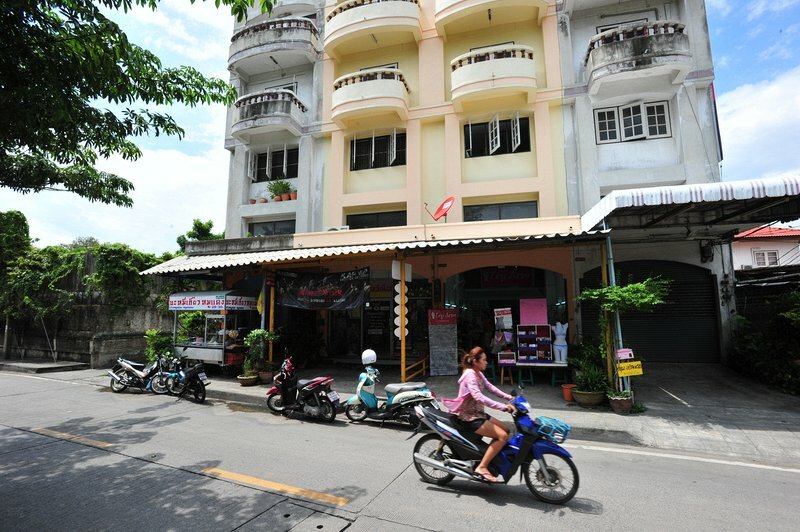 The Try Arm shop is located in an industrial/residential area of Bangkok, just down the street from a Toyota production facility. Try Arm rents the space where they have set up production and shipping areas, as well as sleeping accommodation for some of the women. During my brief visit of the Try Arm factory, I was amazed at the determination and enthusiasm of the women working there. Despite very difficult circumstances they are succeeding. Try Arm gives a whole new meaning to the words “sweat free underwear”. If you would like to know more about Try Arm or if you would like to help them by purchasing some underwear, their website is http://tryarm-eng.blogspot.com/ just be sure to click the English tab, unless of course, you can read Thai. If you would like to get a feel of what it looks and sounds like, here’s a brief, unedited video of women working in the Try Arm factory. Wow..after reading many of your posts..I now really understand what does it mean to be “Humanitarian” photojournalist..You are spreading the words about the power of Humanity in improving the quality of humanity itself..really really a great job…Salute Karl..Cheers.. Great story Karl. I’m in China and cannot view the blogspot site (blocked here), could you send me an email with contact info or other info about TRY ARM? I have just came across your blog and I must say it’s really interesting. Thanks for having time to write contents like these. Hoping to see more from you in the future! Cheers!